Although most people associate Southwest Plastic Surgery of El Paso, TX as being in the business of plastic surgery and health care, we want everyone to know that our business is beauty. Our goal is to bring you as many new, high quality services and products as possible to bring out your very best appearance. New to our product line this season is a series of exciting, premium quality makeup and sunscreen to make sure you age gracefully, while protecting your skin from harmful UV rays. Jane Iredale is the “celebrity quality” makeup that uses high quality minerals. The ingredients improve and protect the areas of your skin, face, neck, eyes, lips and cheeks. The founder, Jane Iredale created the collection as a solution for struggling models, actresses and people in the entertainment industry whose appearances were reliant on having a clear complexion to sustain their careers. It has grown from just being a U.S. based company to now being offered in more than forty countries. The reason why Southwest Plastic Surgery has chosen this particular brand is because of its cruelty-free, gluten-free, vegan commitment. It yields a lightweight finish that doesn’t seem messy, heavy or that clogs pores. Simply put, Jane Iredale skin care is flawless and radiant, giving the user a natural look that doesn’t elicit any harmful or undesirable effects. For those who like to look “tan” but without damaging skin, the collection also offers a Tantasia self-tanner and bronzer. These are some of the great products in the Jane Iredale makeup collection. We will be offering many of these to test the market and see which ones are most popular at our El Paso, TX and Las Cruces, NM clinics. And this makeup is actually suitable for men, too! Stop by our office and let one of our helpful assistants show you this exciting new makeup collection. Many of our patients come to Southwest Plastic Surgery to improve the appearance of their face, neck, upper chest and other areas of their body because of the noticeable effects of aging. The sun is the number one culprit, causing sun spots, freckles, noticeable wrinkles and other characteristics. In order to combat this, you should take every precaution to protect your skin from the UV rays, which can be very intense here in the Southwest regions of Texas and New Mexico. We are now offering high quality sunscreens and makeup to help patients preserve and restore the damage done, especially after getting a facelift or another type of procedure. Colorescience offers a sun protecting series called “Sunforgettable” which gives users the ultimate protection against the sun. All of their products carry a minimum of 30 SPF up to 50 SPF to lessen the likeliness of sun damage. From mineral powders and face primer, to eye screen, lip shine and setting mist, you will have an arsenal of great sun protecting products to ensure your face will remain beautiful. Once again, we have chosen this collection and brand because of its unique formula, which was created with no harsh chemicals or dyes, no alcohol, talc, mineral oil or fragrances. What you see is what you get. Colorescience does not exacerbate skin issues, but rather utilizes a special formula of antioxidants and peptides that gives you maximum SPF power, while being lightweight and non-pore clogging. 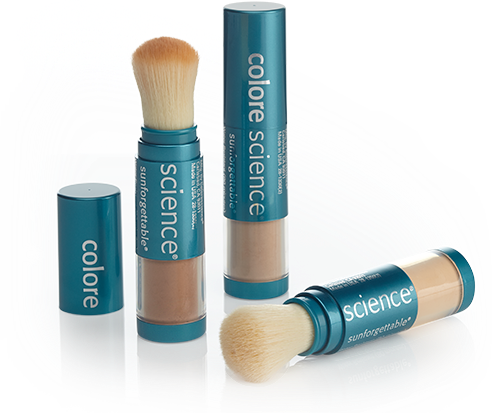 Colorescience is actually good for your skin, which is not only reassuring, but smart for all beauty-conscious clients.